Boeing’s Decision of the Decade: Does It Build the 797? (Bloomberg) -- Boeing Co. executives are closing in on one of their most important decisions of the decade: whether to plow an estimated $15 billion into a new jetliner family. 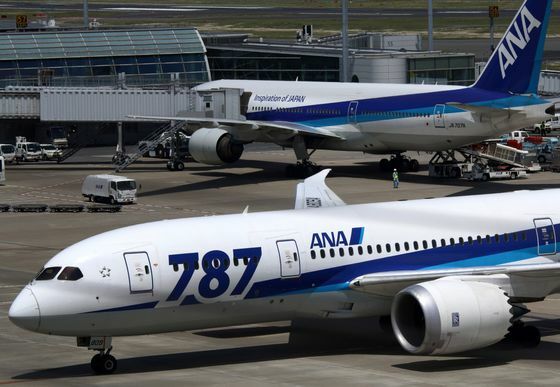 The aircraft nicknamed the 797 would feature Boeing’s first all-new design since the 787 Dreamliner’s unveiling in 2004, while shoring up its product line against recent Airbus SE advances. The European plane-maker’s incoming boss, Guillaume Faury, says he’s waiting for Boeing to tip its hand before revealing counter moves. That sets up a likely showdown at the Paris Air Show in June. Designed for economical flying on mid-range routes, the Boeing jet would have the potential to transform air travel by spawning a new breed of longer-distance budget carriers -- think new flights from Chicago to Berlin, or more economical hops from New York to Los Angeles. But the decision on whether to move forward hasn’t been easy. A misfire would cannibalize sales of the 787 Dreamliner and endanger the cash bounty that has made Boeing a darling of Wall Street. Boeing’s board is expected to review the case for the new program by the end of March, according to people briefed on the matter. For now, the team spearheading the concept, led by former 787 program head Mark Jenks, has been meeting monthly with Chief Executive Officer Dennis Muilenburg and Chief Financial Officer Greg Smith. The sales force has been fine-tuning the design with airlines for at least five years, creating a “will it or won’t it?” drama around the decision on whether to make the plane, known internally at Boeing as the NMA, for new, middle-of-market airplane. “With some planes, the technology is the ‘moonshot’; with this, it’s the business case,” Aboulafia said. The word “moonshot” is the term Boeing uses for quixotic gambles that it has vowed to avoid after loading the 787 Dreamliner with groundbreaking technology and an unproven production system—then losing money on the first 500 or so planes after extensive delays. For Boeing and Airbus, committing to an all-new aircraft is a once-in-a-decade event. Costs are prohibitive, delays are the norm and payoff can take years to materialize. Boeing could easily spend more than $15 billion on the NMA, according to Ken Herbert, analyst with Canaccord Genuity, and Airbus may be forced into a clean-sheet design if sales take off. Airline entrepreneur David Neeleman underscores the potential rewards, and risk, for Boeing. The NMA seems tailor-made for the networks he is weaving together between the Americas and Europe with affordable, yet comfortable flights that skip congested hubs. “I had a briefing from Boeing and I thought it was great,” Neeleman said during a recent visit to Chicago to tout Portugal’s TAP airline, one of his holdings. That’s noteworthy, coming from an executive who has mostly favored Airbus jets at startups such as JetBlue Airways Corp., Brazil’s Azul SA and Moxy, the code name for his latest U.S. project. Unfortunately for Boeing, Neeleman is also impatient for Airbus to speed up a cheaper alternative. “They should be at a lot bigger head start,” he said of the Toulouse, France-based aerospace giant. It’s a hint of the dynamics that can spoil aircraft bets that sprawl over decades. The sales appeal for a plane family overlapping Boeing’s largest single-aisle, the 737 Max 10, and smallest wide-body, the 787-8, is just one question mark. Another is how much savings the company can reap from a new manufacturing system. Muilenburg is increasingly confident Boeing can shave time and money from development and final assembly through new digital tools that anticipate and track how the plane is built, and then monitor how it is flown. The plane-maker’s new military training jet hints at the breakthrough it sees for the NMA. For Boeing’s Super Hornet fighter, factory workers in St. Louis need 1 ½ days to rivet together the two main fuselage sections. On the new T-X trainer, the components are joined in less than an hour, said Leanne Caret, Boeing’s defense chief. If Boeing hesitates, Airbus will woo its customers with capable, if not cutting-edge, jet upgrades. Delta Air Lines Inc. and United Continental Holdings Inc., for example, need to replace hundreds of the aging Boeing 757 and 767 jetliners that once dominated mid-range flying. The Airbus plane that sparked Neeleman’s interest is a relatively simple upgrade of the A321LR jet that would be ready by 2023, two years ahead of the NMA. Redesigned fuel tanks would give it the longest range of any Airbus single-aisle jet. Faury, who is slated to become Airbus’s CEO in April, won’t say if a decision on the so-called A321XLR is imminent—or even if it’s the likeliest response. Boeing’s design features a slightly oval-shaped fuselage that saves weight and fuel by devoting more space to passengers and less to freight in the plane’s belly. A smaller version would seat 220 travelers, while a larger model would seat up to 270 people, with trip costs that are about 40 percent lower than today’s wide-body aircraft. Boeing usually staggers the release of variants within an aircraft family by a year or two. But the manufacturer has mulled certifying the NMA models concurrently to avoid missing the replacement opportunity, according to people familiar with the matter. The 797 will need to be priced somewhere between Airbus’s offerings to be competitive. The A321LR goes for about $60 million with all the bells and whistles, while a wide-body A330-800 is typically priced at about $100 million, said George Dimitroff, head of valuations for Flight Ascend Consultancy.